Identifying novel diagnostic and therapeutic targets is critical to combating a complex, heterogeneous disease such as cancer. Now, investigators at Johns Hopkins have just identified a protein involved in cell proliferation and the development of new blood vessels that could serve as a marker for the early detection of colorectal cancers. The researchers found that the enzyme beta-1,4-galactosyltransferase-V (beta-1,4-GalT-V), was increased in human colorectal cancer tumor cells compared with normal tissue. They also observed an increase in this protein’s activity and in its product lactosylceramide, which leads to an increase in new cells and blood vessels that cancers can use to spread. Findings from the new study—published today in Biochemical and Biophysical Research Communications through an article titled “Lactosylceramide synthase β-1,4-GalT-V: A novel target for the diagnosis and therapy of human colorectal cancer”—also showed that inhibiting this protein and its byproducts halted colorectal cancer cell proliferation. These novel findings demonstrate that lactosylceramide could be added to a growing list of biomarkers such as NMT1, APC, and TP53 in blood tests for colorectal or potentially other cancers to increase their success at early detection of disease. Colorectal cancer affects more than 1.4 million people worldwide, causes over 690,000 deaths, and is third in the prevalence of all cancer types. While screening colonoscopies usually don’t begin until a person turns 50, one of the most common screening tests used is a stool test for colorectal cancer that is based on DNA technology. Outcomes from such tests must be accompanied by a colonoscopy. “So, there is a great need for reliable biomarkers for early-stage diagnosis of colorectal cancer,” Chatterjee adds. In this study, the research team acquired 24 tissue samples archived at Johns Hopkins from colorectal cancer patients to test the samples’ response to antibodies against beta-1,4GalT-V, finding strong reactivity. 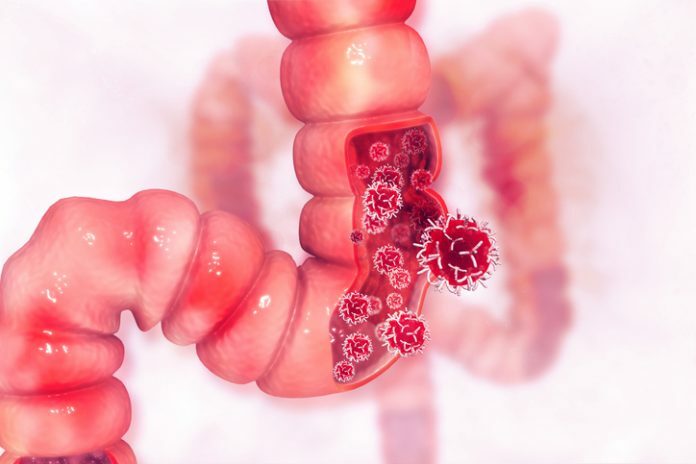 An ELISA test to detect and measure antibodies in 21 of these samples found an approximately 6.5-fold increase of beta-1,4GalT-V in colorectal cancer tissues compared with visibly normal areas within the same samples. Investigators also noted a 2.25-fold increase in lactosylceramide synthase activity in colorectal cancer samples compared with normal colon cells. Additional testing found elevated expression of several genes previously associated with colorectal cancer, such as APC, TP53, and NMT1, in the samples. An earlier study by Chatterjee’s group published in 2013, demonstrated that daily treatment with D-PDMP (D-threo-1-phenly-2-decanoylamino-3-morpholino-1-propanol), an inhibitor that targets cancer pathways, for four weeks halved the size of kidney tumors in mice, by inhibiting the activity and mass of beta-1,4GalT-V. So, investigators also tested lab-grown human colorectal cancer cells called HCT-116 cells and treated them with D-PDMP. They found that over the course of 24 to 96 hours, cells treated with D-PDMP showed a marked reduction in beta-1,4GalT-V (compared with untreated cells used as a comparator) and an increase in cell death.